Home building continued to expand in November, according to the Commerce Department. The annual rate of housing starts grew 3.3% from October to nearly 1.3 million houses. 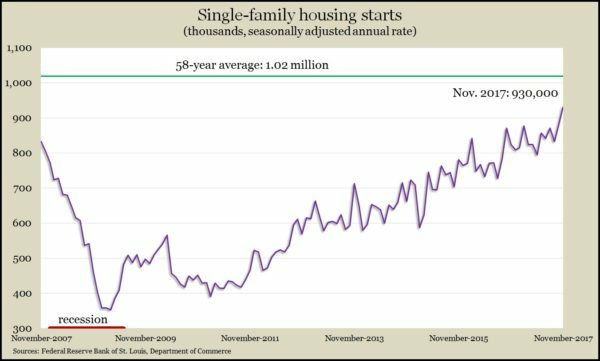 New single-family units started going up at the fastest rate since September 2007 but remain far below the peak pace in 2006 though nearer the long-term average. Housing economists say lack of new houses has helped drive up prices, making homeownership less affordable for more people. Sales of existing houses grew at a faster-than-expected pace in November further straining the supply of houses for sale. The National Association of Realtors reported an annual rate of 5.81 million houses selling in November, up 5.6% from an upwardly revised October pace. It was the strongest month since before the recession. The inventory of houses on the market fell from the year before for 30th consecutive month. The median sale price rose 5.8% for the 69th increase in a row. The U.S. economy did not grow quite as fast in the second quarter as previously estimated, but it still was part of the strongest six months in a year and a half. The Bureau of Economic Analysis said the gross domestic product rose at a 3.2% annual rate, a tad below the earlier report of 3.3%. Consumer spending, which drives 70% of GDP, grew at 2.2%. Business spending increased for the second quarter in a row while housing investments fell. The Federal Reserve Board’s favorite measure of inflation – the core Personal Consumption Expenditure Index – came in at 1.4%, still short of the Fed’s target rate of 2% annual growth. The moving four-week average for initial unemployment claims rose for the first time in three weeks but remained 34% below the 50-year average, suggesting that employers continue to be reluctant to let workers go, which strengthens the job market and raises confidence for consumer spending. The index of leading economic indicators rose 0.4% in November, following an outsized gain of 1.2% in October. The Conference Board said its index suggested “solid” economic growth at least into mid-2018. The business research group cited employment strength, financial indicators, factory orders and consumer sentiment as signs of further economic growth. Durable goods orders rose 1.3% in November, the third rise in four months, lifted by commercial aircraft contracts. Data from the Commerce Department showed the less volatile orders excluding transportation equipment down 0.1% from October but up 5.4% from November 2016. A telltale indicator of business investment dipped for the first time in five months, but it was up 5.1% from the year before, an improvement over earlier this year. The Bureau of Economic Analysis said personal spending rose 0.6% in November, twice the rate of personal income. As a result, the personal saving rate dipped to 2.9% of disposable income, the lowest in 10 years. In the same report, the Federal Reserve’s favorite measure of inflation showed a 1.5% year-to-year increase, up from 1.4% in October and September. On a monthly basis, the Fed’s target rate of 2% has not been met since April 2012. The consumer sentiment survey from the University of Michigan indicates an annual consumer spending rate of 2.6% for 2018. The sentiment index declined from a post-recession high in October. The average reading for the year suggests consumers have been more confident than they have since 2000. In particular, consumers have given high marks to current economic conditions. Expectations declined slightly from recent months, largely along partisan preferences. Another sign of housing’s recent revival is new home sales, which in November reached the fastest annual pace since July 2007. The rate of 733,000 houses sold was still down from a 2005 peak of nearly 1.4 million, but it showed that increased building may be helping a relatively low supply of properties on the market.